This is the view that is the actual ship tracker: from here you can buy / sell cargos, look for passengers, refuel and plot your next location. As I currently see it, the top part is the basic ship info: name, class info, current date and location. The current location is a clickable link to give you a world info view. 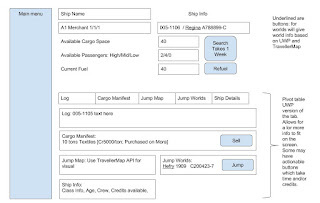 Buttons are Searching for Cargo which will add 7 days to your current date and give you a list of the available cargos and passengers (and I may need to see if we want to make this version specific). Refuel takes no time but will cost you based on your tonnage and type of fuel, and subtract from your current credits. 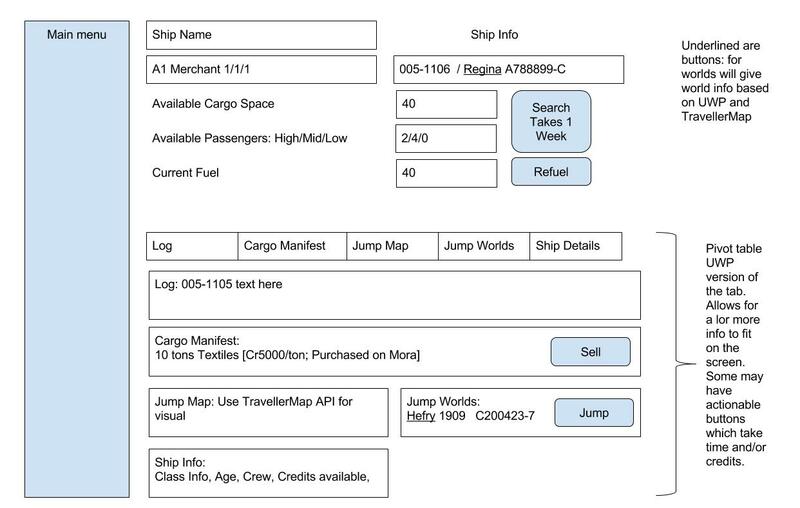 Cargo manifest - shows what you have on board, and allows you to sell the items. It should also have a print manifest option. Jump list - a list of worlds within your jump range with some info. Clicking a world will show world details as above. Ship Info is a catch all for things I've not thought of: when the ship was built, crew listing, things we may have to add. Maybe add a notes section. I may add additional things like world notes - allow you to add notes for the world. No development today - just design stuff and thinking about it.